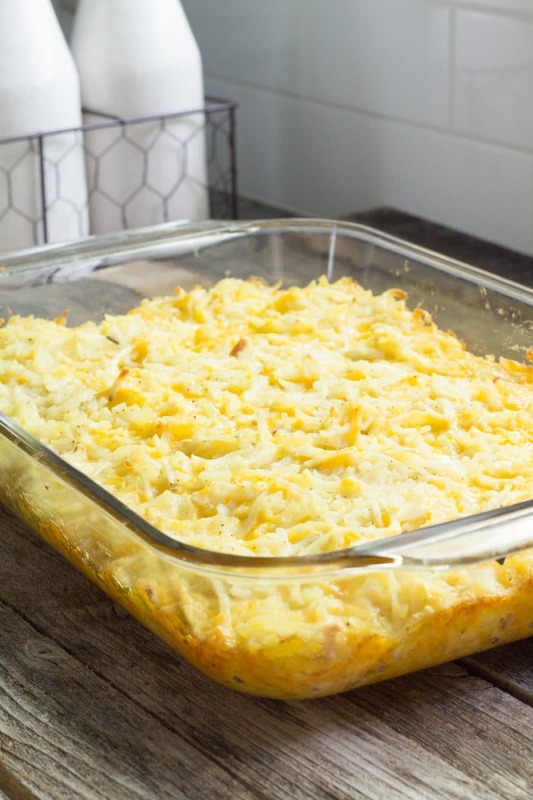 Cheesy hashbrown casserole is a cheesy potato comfort food side dish that’s quick and easy to put together. This potato casserole is great with breakfast or dinner. 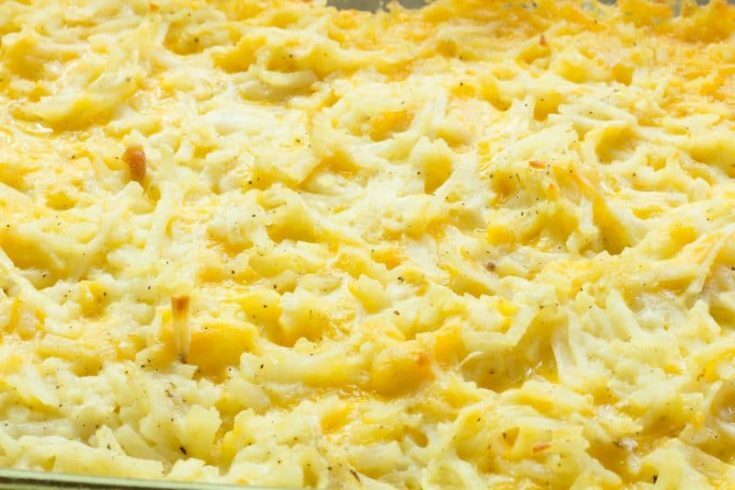 Cheesy Hashbrown Casserole is a classic comfort side dish. Ready to serve a crowd in under an hour. Perfect addition to any holiday table, especially if you are looking for an alternative to your standard fare. 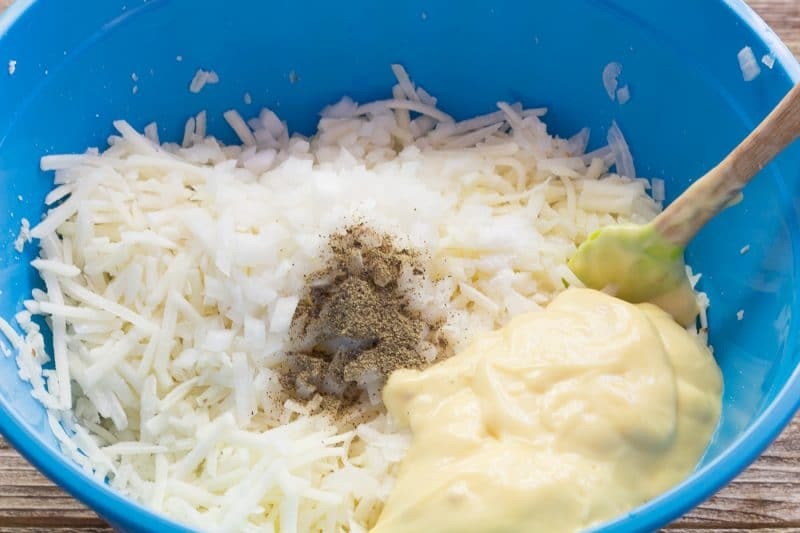 This recipe does not have sour cream and is perfect for those who like a little potato with their cheese. 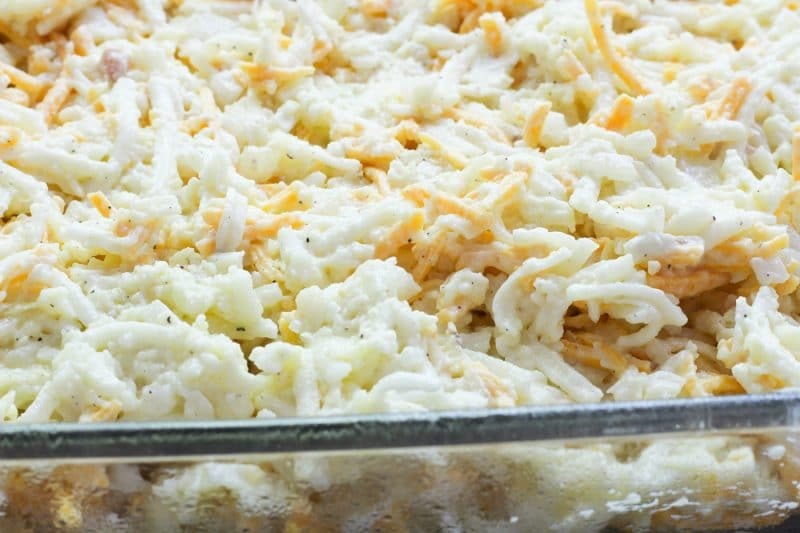 Sour cream is not necessary to produce a creamy hashbrown casserole. We add 1/4 cup of heavy cream or milk to ours because it gives it a little more moisture and the creaminess of this casserole comes from the addition of heavy cream, half and half, or milk. One bowl is all that is needed for making this recipe. Fewer dishes mean less work. One-bowl recipes are perfect when cooking during the holidays and dishes are already starting to stack up. Just mix it all up, pour it into a casserole dish, wash out the bowl and voila, its ready for another use. I start with frozen hashbrowns. You can see the glass casserole dish sweating as the hash browns were thawing. This condensation moisture will not affect the finished dish. Since condensed soup and cheddar cheese has plenty of sodium, you do not add any additional salt. We do add extra pepper on occasion though, as we find that the pepper flavor muted. To keep the dish kid-friendly, this extra pepper has not been added to the ingredients for those folks that do not read through posts first. Resist the urge to pack this mixture down. Loosely packed potatoes will produce a texture pretty close to the dish from Cracker Barrel. Can hashbrown casserole be reheated? There are two options, microwaving and re-baking. To microwave, place a serving of hashbrown casserole on a microwave-safe plate and microwave for 30 to 60 seconds or until heated through. Larger serving may require a few more minutes and would do best if stirred after the first minute of cooking. To reheat in the oven, cover the casserole dish with a layer of aluminum foil and bake in a 300 Degree F oven for 20 to 30 minutes. Can hashbrown casserole be made the night before or ahead of time? Partially. The casserole can be assembled the evening before and stored in the refrigerator. For best results, the casserole should be baked as close to serving time as possible. 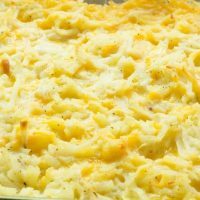 Can hashbrown casserole be frozen? 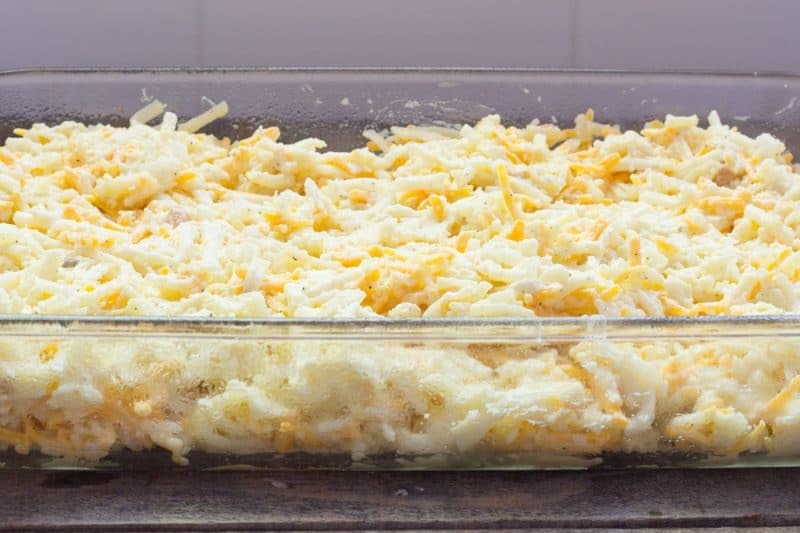 Hashbrown casserole that has been assembled but not baked could be frozen and allowed to thaw in the refrigerator prior to baking, but hash brown casserole is so easy to assemble I wouldn’t bother. 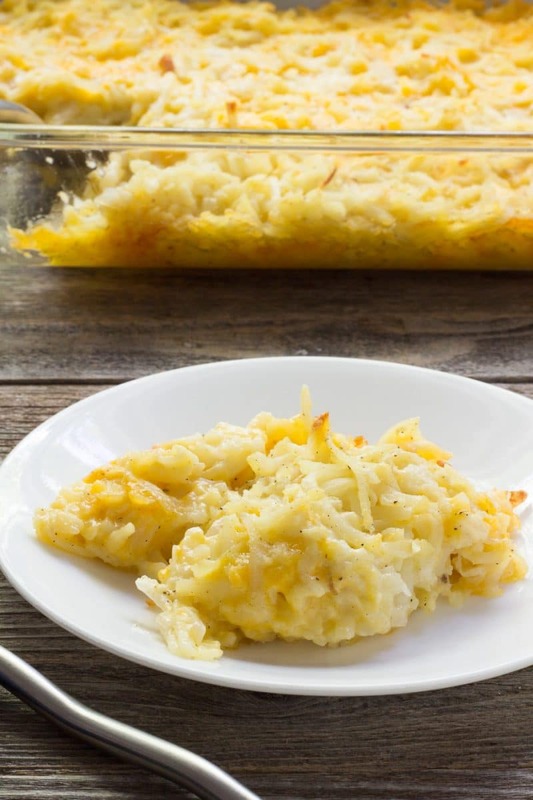 Cooked hashbrown casserole can be frozen if stored in a freezer safe container. It needs to be allowed to that in the refrigerator. Once its thawed go ahead and reheat as answered above. Much of the creaminess may be lost using this method of storage and reheating. 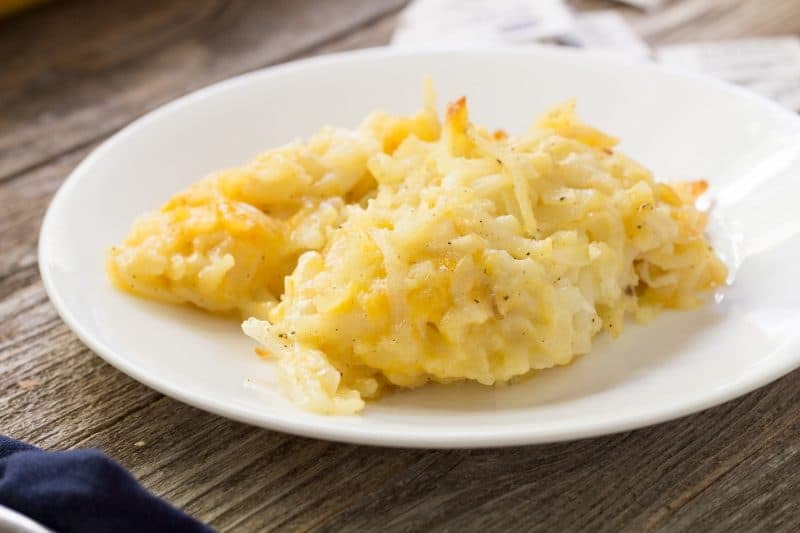 Can hashbrown casserole be made in a slow cooker? It can, but it takes much longer in the slow cooker than in the oven. Spray the inside of a slow cooker with a non-stick baking spray or use a slow cooker liner to make clean-up easier. Just mix everything together as directed in the recipe and place it into the slow cooker and cook on low for 5 to 6 hours. Can I use refrigerated shredded hash brown instead of the frozen one? Yep, you can even use the diced hash browns frozen or refrigerated. Do I have to use canned soup for hash brown casserole? You can substitute a white sauce that has been flavored with some powdered bouillon. For substitution in our recipe, you will need 3 tablespoons of butter, 3 tablespoons of all-purpose flour, 1 teaspoon bouillon granules, and 1 cup of milk. Melt the butter in a small skillet over medium heat. Add flour and granules and cook until bubbling. Cook for 1 to 2 minutes. Using a whisk, add the milk all at once and whisk until thick and bubbly. Remove from the heat and allow to cool before adding to the hash brown mix. How do I add a cracker crumb topping to hash brown casserole? A cracker crumb topping that is suitable for this casserole and other casserole dishes is simply made by mixing 1 cup of saltine cracker crumbs, or buttery cracker crumbs with 2 tablespoons of melted butter. Add the topping to your casserole prior to baking. Use as much or as little of the topping as you would like. Alternatively, you could even use cornflake crumbs, like above, 1 cup of crumbs to 2 tablespoons of melted butter. Is there meat in hashbrown casserole? 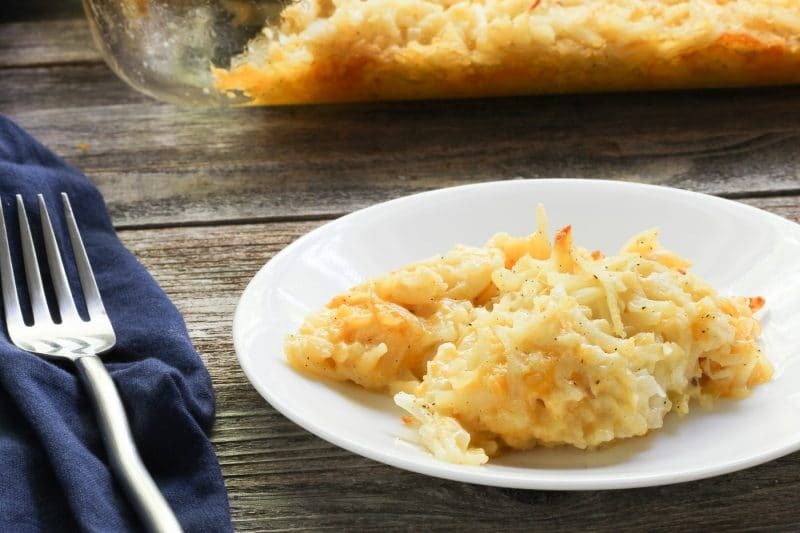 Most hash brown casserole recipes do not have meat in them, but meat can be added. Small diced ham, cooked sausage, or cooked crumbled bacon could be added to this casserole without issue. Just add it in with the rest of the ingredient prior to cooking. Is there sour cream in hashbrown casserole? Sour cream is added to many recipes. Our recipe does not contain any sour cream. The heavy cream/milk can be replaced with sour cream. Prepare a 9 X 13 pan or a casserole dish by coating with a baking spray. Combine shredded potatoes, black pepper, and onions in a large bowl. Add the cream of chicken soup, melted butter, and heavy cream. Mix to combine. Add the cheddar cheese and stir gently, just until cheese is distributed evenly. Put potato mixture into the prepared baking dish. Smooth out mixture evenly, but do not pat down. Place pan into preheated 350 Degree F oven. Bake for 30 to 40 minutes, or until the top begins to lightly brown and casserole is bubbling.